Questo tour di mezza giornata di Best of Chiang Mai è un orientamento ideale per la città per coloro che sono appena arrivati. Ottieni la disposizione del terreno su una panoramica corsa in Tuk-Tuk, rilassandoti mentre il tuo autista naviga. 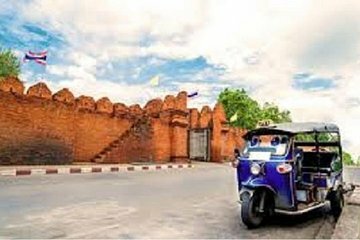 Visita le porte storiche, i famosi templi e il mercato Warorot di Chiang Mai. La tua guida parlante inglese ti porterà da e verso il tuo alloggio. My daughter an i thoroughly enjoyed this trip. We had independently 'tuk tuked' around Bangkok so it was nice to be able to relax and let someone do the mapping. we were picked up on time, our driver was very steady - which we found quite amusing after the Bangkok experiences, and the guide was exceptionally knowledgeable with great English. He allowed us to control the time we spent at each of the places visited while politely keeping us in time check. He bartered prices for us and got my daughter some great deals at the market. The tour consisted of a visit to 4 temples and one market. I thought,perhaps we may have seen a bit more variety. Also the half day was only 3 hours. The Tuk-Tuk was in very poor condition. The upholstery was torn and the passenger seat very old and hard compared to many others we saw on the street. Also the fumes from the exhaust were very strong. Obviously there was a mechanical issue. On the whole I was left a little disappointed as having been on a couple of other Viator tours , which were very good, I expected a bit more.